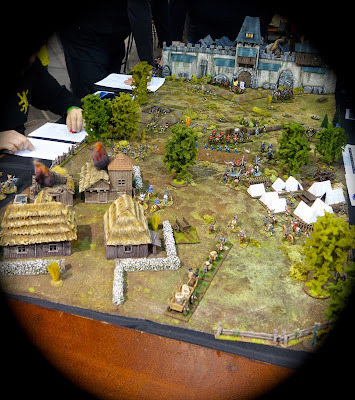 We completed our little jaunt to the Netherlands and Belgium with a visit to Antwerp and the excellent CRISIS wargames show organised by the Tin Soldiers of Antwerp. Unlike last year it was unseasonably warm rather than gale force freezing winds and horizontal rain so it was rather pleasant waiting for our taxi and the trundling to the event premises on the Scheldt. Like last year I had arranged a queue-buster ticket (nothing of the sort exists but I had negotiated to go in at the side door to avoid standing in a very long line of punters, including a certain acquaintance of ours Dave Docherty. We were ushered to the info stand by the legendary Willie Bogaerts where I paid our entry, bought some 'coins' and the two figures that complement the free give away set. Katherine then said she wanted to go round on her own as I walk too slowly so off she went, as did I. I will give a bit of a summary at the end of this post but will start with a run through of the photos I took of many the games. 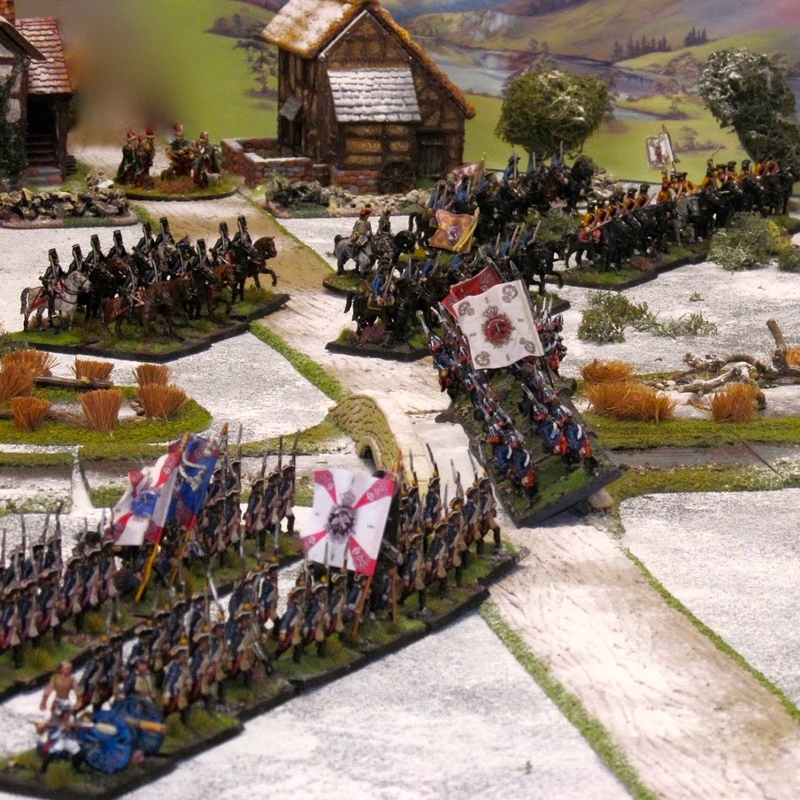 If your game isn't featured its either because the photo was crap or I couldn't find you, not because I was conducting any kind of trial by photograph by a died in the wool 28mm historical fanatic. Also, I don't have all the club names to hand as I'm writing this but will edit the post when I find my programme. A rather excellent little Darkest Africa game. The boats and mud fort were cool. A close up of the mud fort. I also liked the mud huts. I think they are Grand Manner, some at least as I have a few just like them at home in Darkest Underthetableland. One of my favourite games was this French Revolutionary War game set in Flanders in 1793 by Jan and Peter of Der Alde Garde club. Actually, they ARE the club, all two of them, and always put on a great game. 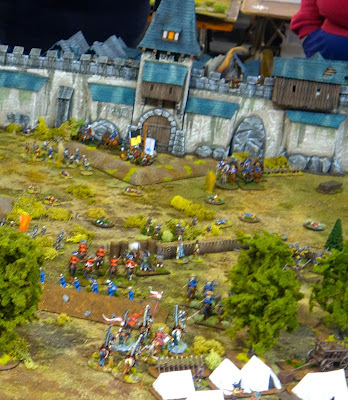 There are more photos later on but I was especially taken by the fortress which Peter had scratch built. 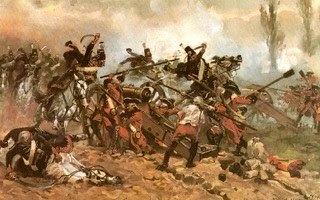 I had a good long chat with Jan (hello Jan if you're reading this) about the FRW and the 1799 Helder campaign. Quite a colourful Crusades game 'Jerusalem', by the South London Warlords. It was very pretty but a bit the array of labels at the back of each unit tended to be a little distracting. The Warlords again, this time with Daleks in 54mm. I liked this as I am a bit Dr Who fan (the old ones that were actually scary....to a seven year old at any rate!). Totally random fact, I have a Dalek in my Prussian SYW army too. This and the photo below are of a good looking French-Indian Wars game featuring native Americans , Rangers and Colonial Militiamen by the Dortmund Amateur Wargamers. Victorian Sci Fi on Mars. Not my thing but it looked good. The pride of the French 'navy' on Mars. And the Imperial Germans. Kaiser Bill's Martian fleet. 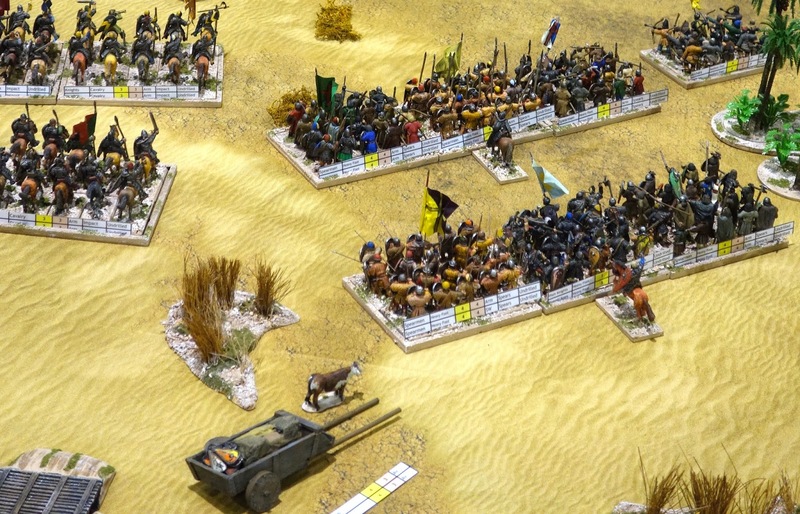 An excellent 54mm Ancient game representing the Battle of Plataea by a group called PMDC. The long lines of very nicely painted Hoplites looked the part. ....as did the hoards of colourful Persians. 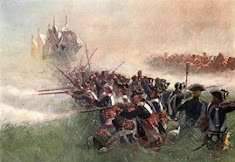 The Battle of Trenton 1777. The snow had a certain realistic sparkle which turned out to be because of on closer inspection turned out to be salt crystals scattered over the table. An ancient game using To the Strongest. Wine too! The following few photos are of The League of Augsberg's 1690s game. As always, very colourful and some excellent tabletop ephemera. The absolute star of the show for me was this refight of Poltava in the Great Northern War, by John and Diane Sutherland. Thousands of Warfare Miniatures figures and an excellent piece of product placement as the game was right next door to the Warfare trade stand. How good is that? The game looked magnificent. All the terrain was scarce built by Diane. The playing surface was that outdoor carpet often seen on decking or patio areas, painted for effect, and very good it looks too. 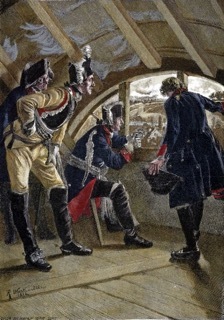 The Swedes overrun the first redoubts. 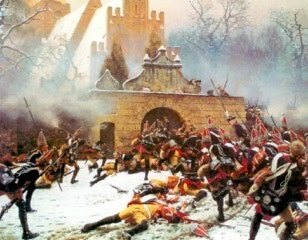 Russian reinforcements advancing en masse. It looks a little worrying for the Swedes. Home made measuring sticks constructed from Wilko's chopsticks by Diane. You may recognise her nail polish. The Russian camp with, yes...more Russians! 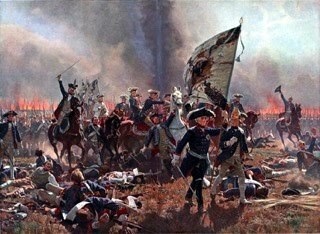 I think this is the Kurphaltz Feldherren Wargames witgame entitled 1655. Afghanistan 1879'ish but I can't remember if this is by the Two Fat Ladies or the Ligue de gentlemen civilisateurs using Osprey's TMWWBK (The Man Who Would be King). Tin Soldiers of Antwerp put on the Battle of Dorking using their own rules which I really must try as I bought a copy last year. ...and some beer. We bumped into Dave D again in the bat. The Leicester Phat Cats put on this Blood and Plunder pirates game. Note to self. Find my sloop and finish it. Back to Der Alde Garden and their Flanders 1793 game. The figures are all Eureka 28mm . So there you have it. Apologies if I've misidentified any of the games. Overall I would say that Crisis is a well run event by a friendly and helpful club (TSA). It is sooo much better than Salute is these days; indeed its better than many UK shows I can think of. Then again many of the games and most of the traders are UK based, and one wonders what will happen to the show after Brexit? Certainly talking to several UK manufacturers they said that depending upon the level of custom controls (which is likely to be high) then it would not be worth their while to attend as their margins would be eaten into by customs charges and the mountain of paperwork that they expect will be required to take their stock to Antwerp and then account for their sales on the way back. Crisis therefore could in a few years time be yet another casualty of Brexit, dependent upon what sort of 'deal' HMG manages to blunder through. Enough politics. Mats. 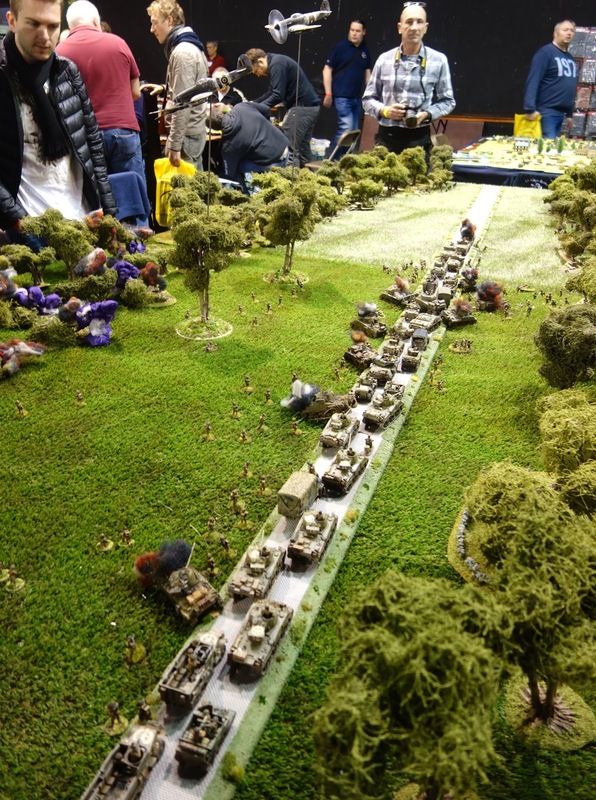 An abundance of table top terrain mats. There were at least three traders selling them. Tiny, Deep Cut and another one. Many of the games also utilised a terrain mat instead of sculpted terrain pieces. Much easier to carry and they can be just as effective. I have several and use them all the time. Swag. Not much really. I finally got my flags off Flag Dude that I ordered at Salute this year. I also collected a couple of pre-orders, one from Early War Miniatures (rubber stuff.....er roads etc.) and Warfare miniatures (some limbers and other ephemera). I also had a good rummage on the Trent stand and picked up some Vendean rebels ro add another dimension to my FRW collection. Oh, and katherine was quite taken by the Deep Cut river sections, so I took advantage of this to buy a set (two actually). We left around 2pm and went into town for lunch. Who did we meet when we were coming out of the restaurant? Why Dave Docherty of course. All things being equal we shall be back next year as this was the end of an excellent trip. Thanks for taking the time to post so many photos. I think my favourite game has to be the FRW one. Having seen these photos and some of Fall In in the States, I have to agree that both shows are much better than anything seen on the UK. 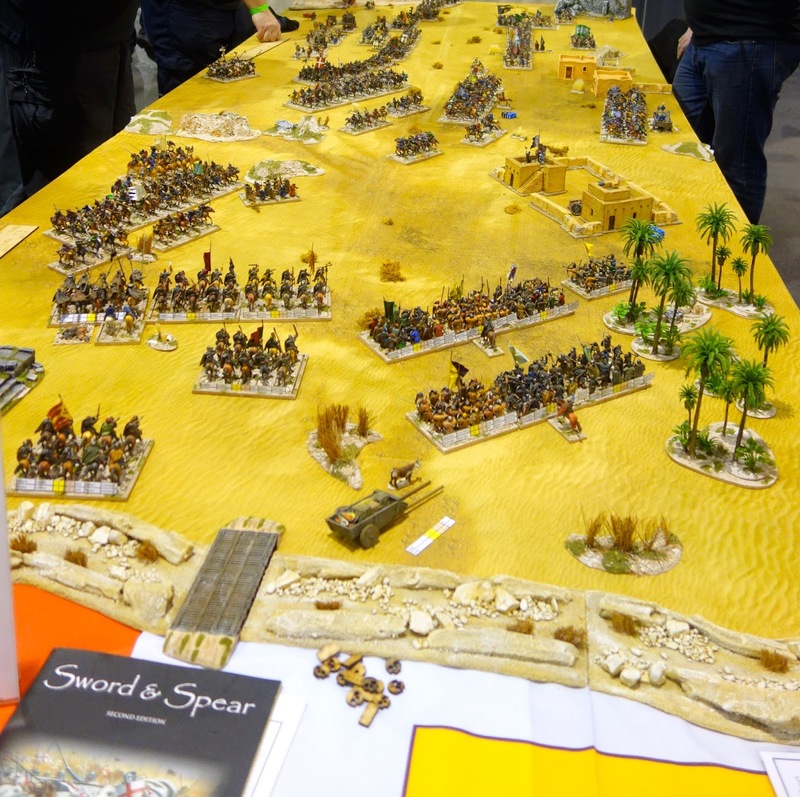 I only attend Salute as I help some friends out on a table, otherwise I simply wouldn't bother, as it seems to be a shopping trip with some games thrown in, almost as an after thought. cheers Steve. I think the two Partizans are much better. Thanks Colin, really enjoyed those and will return for another browse later. So many splendid and impressive tables...awesome! A fine account of what you saw and some nice pictures too. As to Brexit’s possible effects on the show, who can say at this juncture? You know where I stand on the matter, so we have to wait and see. Business will find a way, it generally does. What a great report Colin and great to see you enjoyed the show with your lovely wife as well. Excellent to hear Dave D is still enjoying the fine delicacies that the region has on offer whilst wargaming throughout Europe. All the best. If Crisis ceases to be viable because of the absence of UK traders, that would seem to be due to Belgian blundering? Thanks Colin for such a comprehensive report. Thank you too for keeping visible yet another of the unfortunate consequences of the lemming-like rush to crash us over the Brexit cliff. Indeed it was great day . 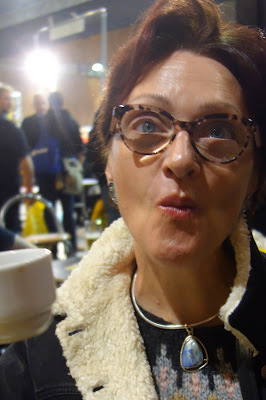 And slightly amusing bumping into you and Katherine I; th3 queue and then then randomly in the same brasserie later . I too wanted to see this pre brexit as I think it will change . I am tempted to try and turn a game at it next year .. Thanks for posting the photos of these dazzling games. I am taken with that megalomaniac mortar going boom. 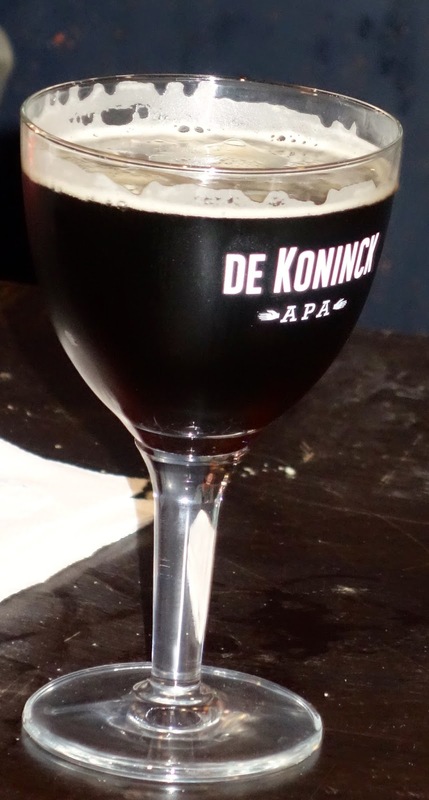 A glass of De Koninck... Nice choice! Colin,thanks for the Crisis review and esp your kind words of our 1793 ģame. Peter is glowing with pride about all comments. It was very nice to talk to you at Crisis and if you are in need of more information of the 1799 campaign maybe I can be of assistance. Thank you for a,great show report. It seems that the game quality at Crisis is consistently higher than other shows. That Vauban Fort gate is some of the finest modeling that I've ever seen. Great report Colin, thanks for being the roving reporter! 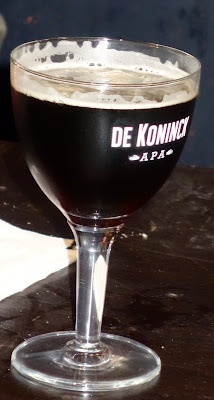 I really fancy a trip to a European show, to be honest flying from Aberdeen to Europe is sometimes cheaper than flying to London so a weekender to Belgium and some lovely Bier is something I need to get my finger out and organise. Stuart GO FOR IT! It's easy to get to Antwerp just train from Schippol. I can highly recommend the show as part of a weekend.